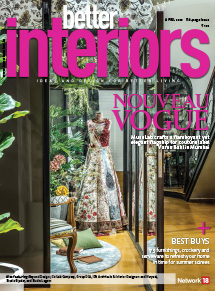 We invited the talented team of stylists at the upmarket luxury brand Pinakin in Mumbai to create a living room setting for this holiday season. They envisaged a space for Christmas that oozes of a cosy, relaxed and cheery vibe devoid of the quintessential X-Mas symbols and motifs. 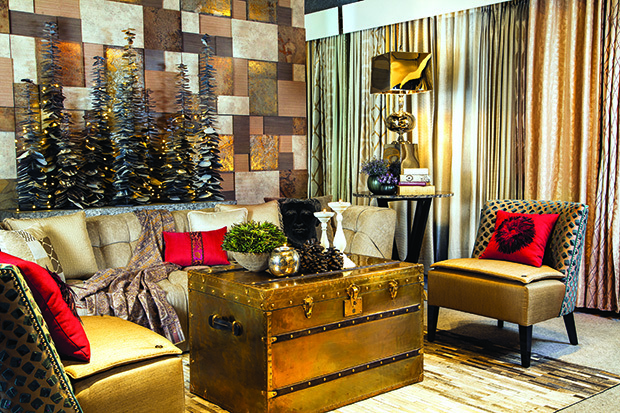 Three festive hues reign supreme here: gold, red and green that have been dispersed in a controlled amount through the furniture, furnishings and accessories. 1 Christmas is all about spreading cheer, spending time with loved ones and indulging in festive decorations for the home. 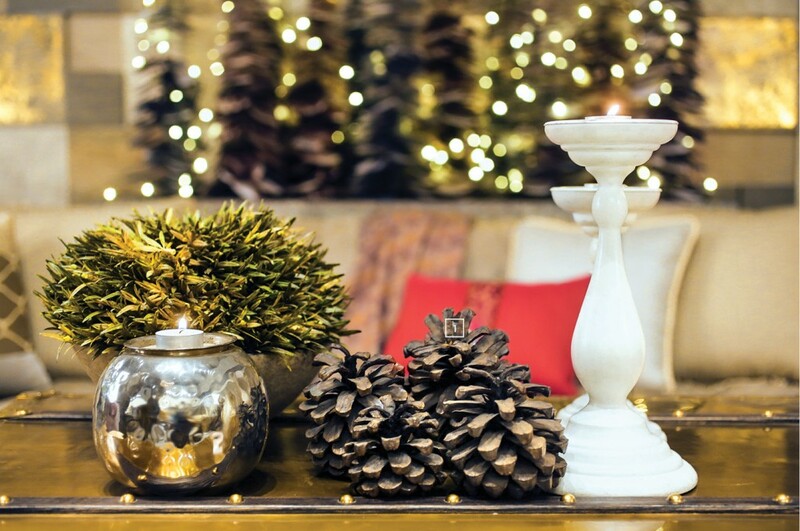 Here, a vase with green bush, a shiny tea light and candle stand and pine cones represent colour, light and joy… symbols that define this festival. 2 This unconventional Streamer trunk will grab eyeballs when kept as the centre table in your living room. 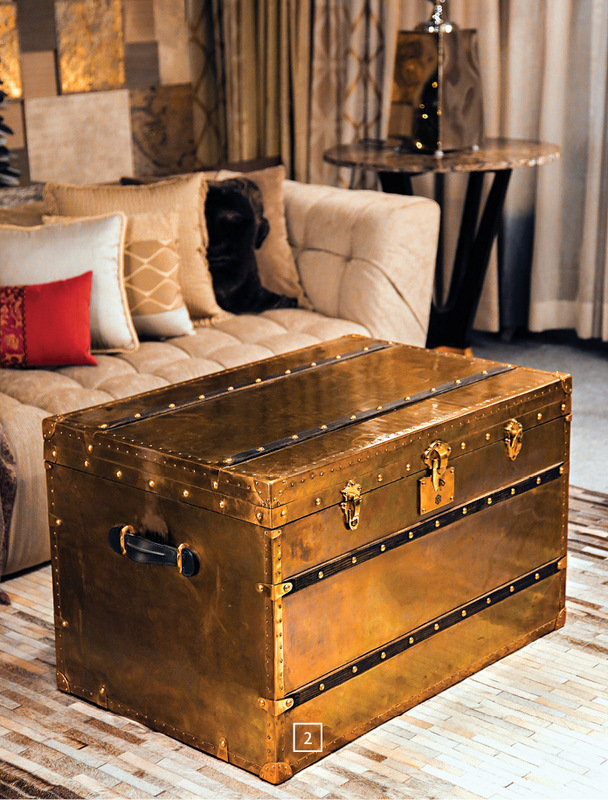 Made of antique brass and wood with a vintage leather and suede interior; it’s a good hiding place for your Christmas gifts; Rs. 1,63,125; PINAKIN. 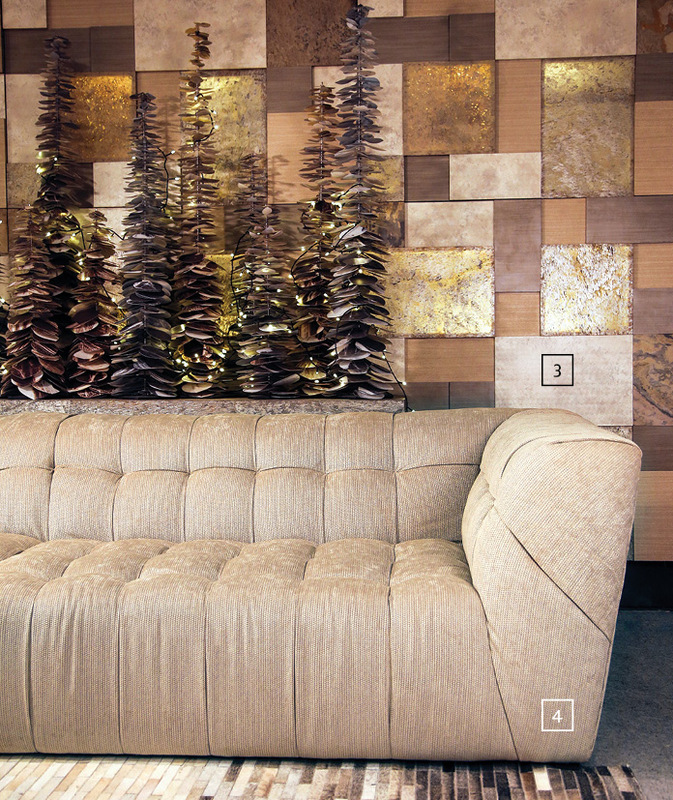 3 A mosaic of stone, veneers and acrylic… the Glow Wall Cladding Panels will enhance the luxe quotient of any space with its gold and beige hued surface; Rs. 2,815 per sq ft; PINAKIN. 4 The beige chenille tufted Taper sofa makes you want to curl up with a hot cup of cocoa and wait for Santa while he comes down the chimney bearing gifts; Rs. 2,41,200; PINAKIN. 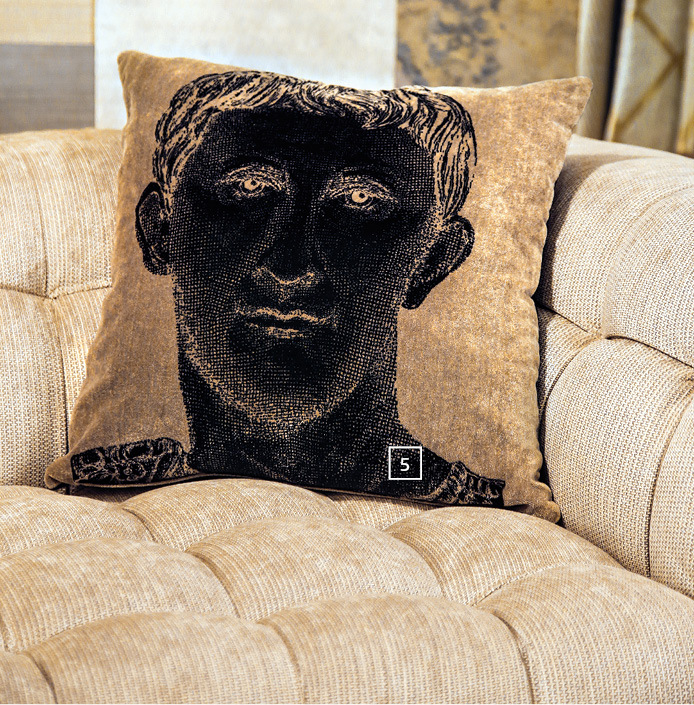 5 Add a bit of Greek history to your drawing room decor with this velvet cushion with Alexander the Great’s face printed on it; Rs. 12,000; PINAKIN. 6 Designed by the famed designer Pinakin Patel, the luxurious-looking Imperial Profile Chair has a polyester seat, black PU gloss polished wooden legs and a back rest upholstered in raw silk with velvet patches. Not only does it look comfortable but it blends well with the setting too; Rs. 74,532; PINAKIN. 7 The bright red cushion cover is stitched in cotton fabric. 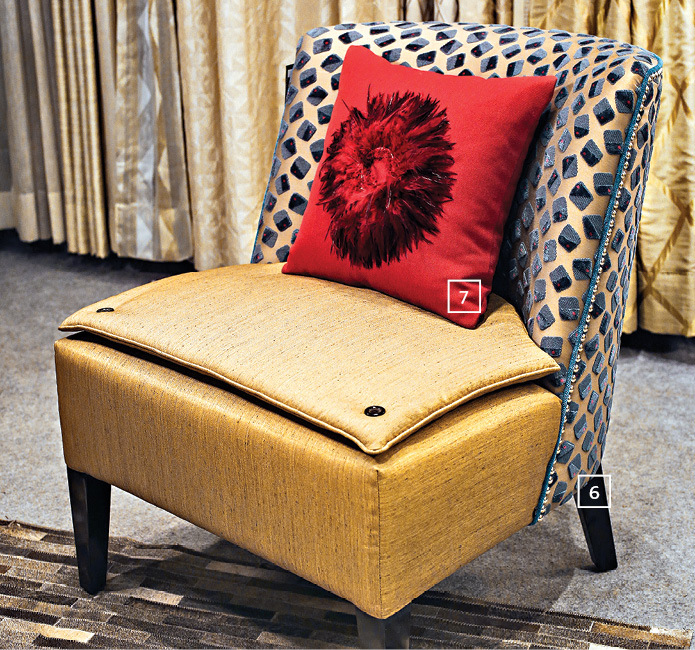 The USP of this cushion is the red faux feathers, each of which have been hand stitched individually; Rs. 4,722; PINAKIN. 8 The Taper Side table goes well with the shades of the other furniture and accessories. 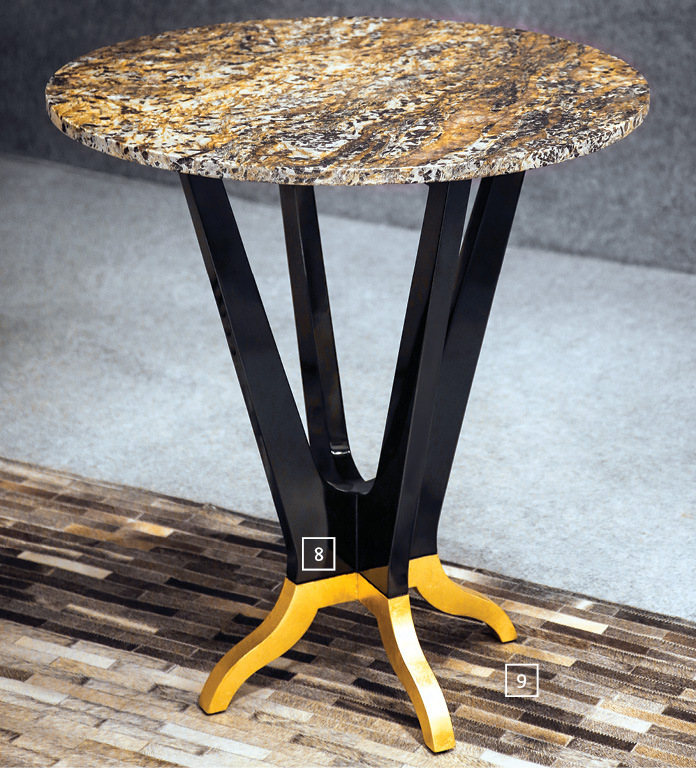 A textured precious marble top and black lacquer and gold leafed legs makes it apt for this set-up; Rs. 37,800; PINAKIN. 9 The Patchwork carpet is made of 100 per cent short haired leather; PINAKIN. 10 Wrap this throw made from 100 per cent cotton on a chilly winter night and make yourself warm; Rs. 3,950; PINAKIN. 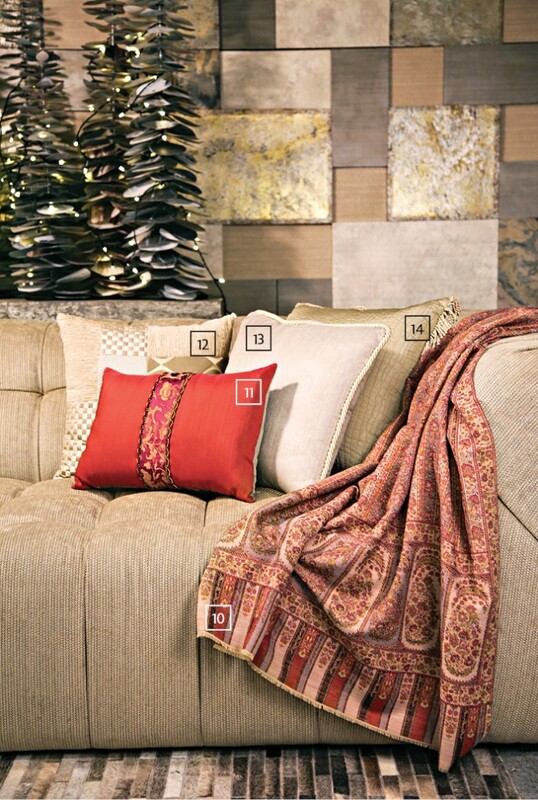 11 We all know that a bunch of cushions in various colours, textures and patterns have the ability to set the mood of any given space. The bright red silk cushion with tube lace and gold thread embroidery stands out in the neutral surroundings; Rs. 3,500; PINAKIN. 12 The patchwork cushion is made from a mix of polyester to replicate raw silk, velvet, chenille, suede and corduroy; Rs. 3,500; PINAKIN. 13 An odd one out of sorts, the grey-coloured plain cushion is created from polyester with silk tassels and borders; Rs. 1,500; PINAKIN. 14 When put together with the others, this beige textured cushion fits in well with the entire look created for this setting. Polyester has been used to make this one; Rs. 2,500; PINAKIN. 15 Its hard to imagine a home without a Christmas tree covered with light and baubles during the festival. 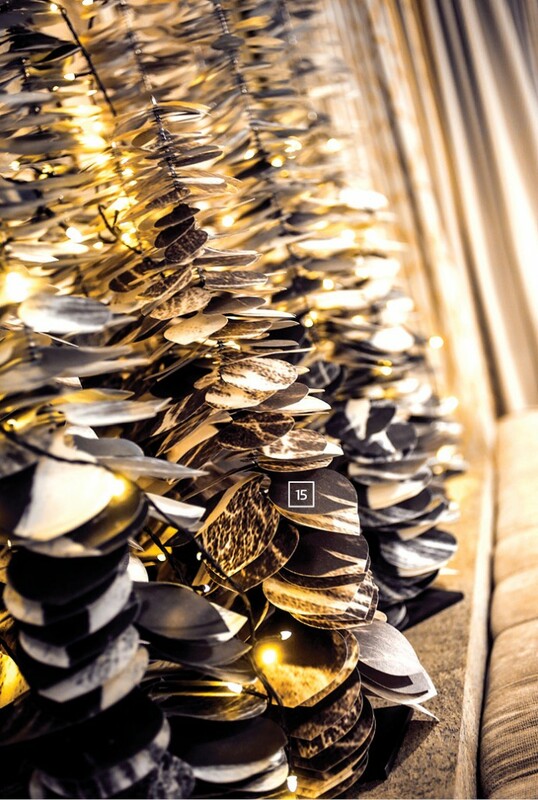 Taking this sentiment to another level, X-Mas trees in four different sizes made from paper veneers are lined up to create that festive aura; Rs. 9,000 to Rs. 10,500 (depending on size); PINAKIN. 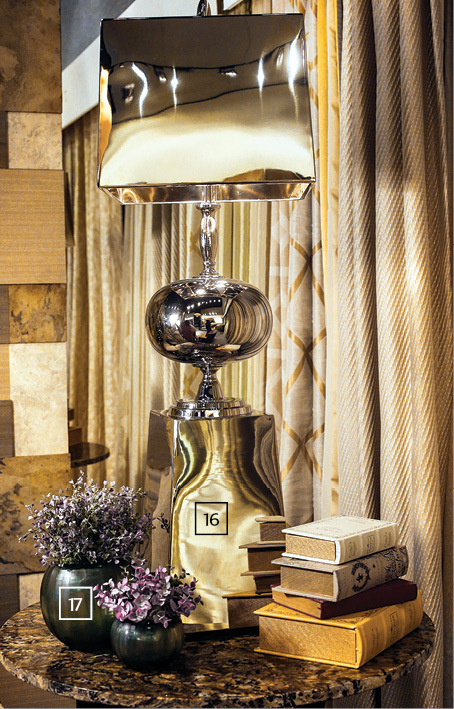 16 A bit of shimmer and sparkle is dispersed into the room with the Buffet lamp that reflects light. Its metal shade is crafted from nickel; ` 36,750; PINAKIN. 17 The Dome vases made from tinted glass sit pretty on the side table; ` 10,125 (set of three); PINAKIN. Unlisted prices are on request. Prices are subject to taxes wherever applicable.